Last edited by zenjt on Sun Nov 27, 2011 4:10 pm, edited 5 times in total. Last edited by zenjt on Sun Nov 27, 2011 4:11 pm, edited 1 time in total. 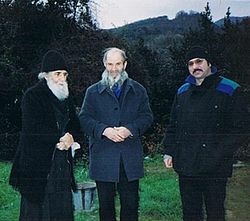 Gerontas Paisios with father and brother of hieromonk Nicholas Generalov. Last edited by rose on Tue Dec 06, 2011 2:33 am, edited 1 time in total.